UKAS Accredited laboratory, & Specialist GRC consultancy services. GRC Synergies is an independent GRC consultant working on a global basis providing compliance inspection and assessment services to EN, ASTM, and GRCA standards. 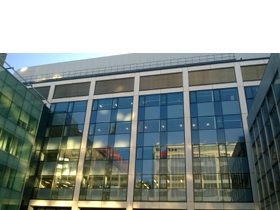 Their clients include many of the world’s leading façade envelope contractors who utilise GRC Synergies' services to ensure a high quality and cost effective GRC supply chain. 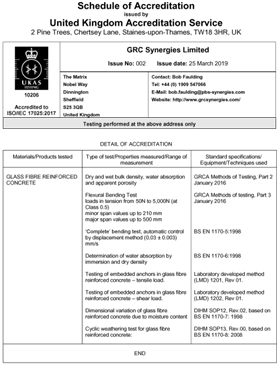 GRC Synergies operate their own UKAS accredited laboratory which can test to all applicable EN, ASTM and GRCA test methods including EN 1170-7 and 1170-8. 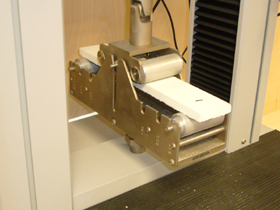 Their specialist bending test rig allows them to test coupons for flexural strength up to 20mm in thickness allowing them to carry out flexural strength tests on samples cut from finished products. This is invaluable to GRC Synergies' customers who want to ensure that manufactured cladding panels exhibit the same characteristic strengths as the manufactured test boards produced as part of the quality assurance process. GRC Synergies have also developed in house Laboratory Manual Methods for embedded anchor testing which they feel is an essential part of GRC manufacture and yet is not covered by any standards or testing methods. Other activities include post completion investigatory work and expert witness assistance. The company is also the contracted quality partner of the GRCA providing auditing services for the Association’s “Full Member” certification programme. GRC Synergies carry full professional indemnity insurance, are BSI certified as an ISO 9001 compliant company and are CHAS accredited for their on site activities.